This chart contains a comprehensive listing of professional Kansas lice removal businesses. Some of these companies actually operate treatment centers, which can be sort of like hair salons. Many of these are set up so that kids can watch movies while the professionals comb lice and nits out of their hair. Other companies travel directly to customers' homes to treat and remove head lice. Please contact these businesses directly for further information. Lice Free Today! none Kansas City metro area. Johnson & Wyandotte Counties in KS. Check out the page on this site regarding how to choose among lice removal services. 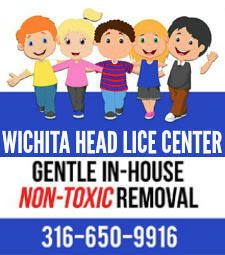 Know of another Kansas lice service that should be added to this page? We want our directory to be as complete as possible. Please let us know using the form below, and we'll update the list promptly.